www.cheersonline.com 45 September 2015 • ON THE ROAD owner Thierry Gardere, whose great-great uncle Dupré Barbancourt started the compa- ny. Barbancourt was out of commission for months due to damages from the quake. But the distillery has come roaring back in the past five years, with a rebranding and new products, including Pango, a pineapple-mango expression. Barbancourt is also planning a ma- jor facility expansion. WIRSPA MAKES ITS MARQUE A key part of WIRSPA's rum education initiative is the Authentic Caribbean Rum Marque, a stamp of authenticity, prove- nance and quality for rums produced in 13 Caribbean countries. 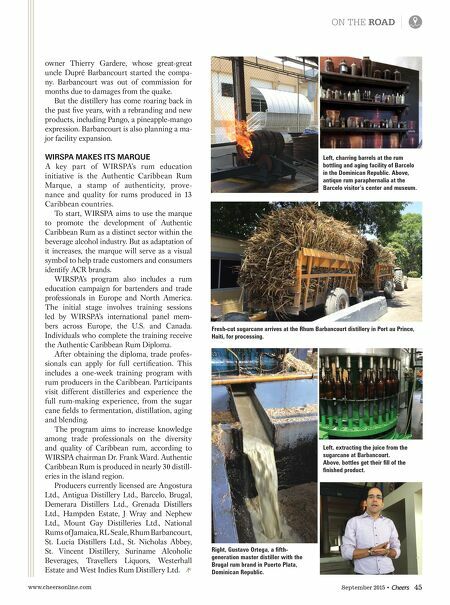 To start, WIRSPA aims to use the marque to promote the development of Authentic Caribbean Rum as a distinct sector within the beverage alcohol industry. But as adaptation of it increases, the marque will serve as a visual symbol to help trade customers and consumers identify ACR brands. 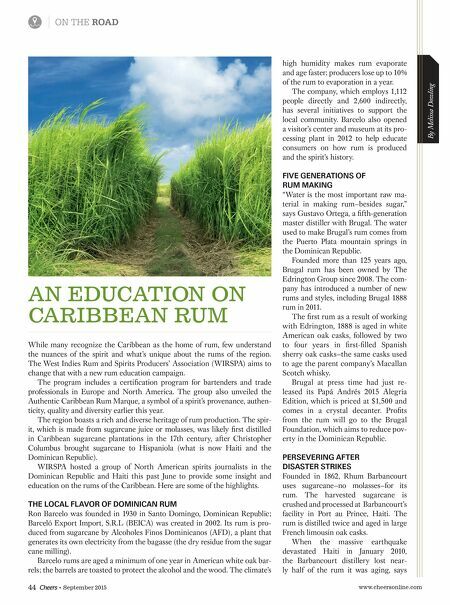 WIRSPA's program also includes a rum education campaign for bartenders and trade professionals in Europe and North America. The initial stage involves training sessions led by WIRSPA's international panel mem- bers across Europe, the U.S. and Canada. Individuals who complete the training receive the Authentic Caribbean Rum Diploma. After obtaining the diploma, trade profes- sionals can apply for full certification. This includes a one-week training program with rum producers in the Caribbean. Participants visit different distilleries and experience the full rum-making experience, from the sugar cane fields to fermentation, distillation, aging and blending. The program aims to increase knowledge among trade professionals on the diversity and quality of Caribbean rum, according to WIRSPA chairman Dr. Frank Ward. Authentic Caribbean Rum is produced in nearly 30 distill- eries in the island region. Producers currently licensed are Angostura Ltd., Antigua Distillery Ltd., Barcelo, Brugal, Demerara Distillers Ltd., Grenada Distillers Ltd., Hampden Estate, J Wray and Nephew Ltd., Mount Gay Distilleries Ltd., National Rums of Jamaica, RL Seale, Rhum Barbancourt, St. Lucia Distillers Ltd., St. Nicholas Abbey, St. Vincent Distillery, Suriname Alcoholic Beverages, Travellers Liquors, Westerhall Estate and West Indies Rum Distillery Ltd. Left, charring barrels at the rum bottling and aging facility of Barcelo in the Dominican Republic. Above, antique rum paraphernalia at the Barcelo visitor's center and museum. Fresh-cut sugarcane arrives at the Rhum Barbancourt distillery in Port au Prince, Haiti, for processing. Left, extracting the juice from the sugarcane at Barbancourt. Above, bottles get their fill of the finished product. Right, Gustavo Ortega, a fifth- generation master distiller with the Brugal rum brand in Puerto Plata, Dominican Republic.